5 additional costumes from the PSP version have been removed. Due to a bug introduced by Mastiff, unlocked costumes don't carry over to NG+. Gameplay is locked to 30 FPS. English version suffers from various typos, spelling, and translation errors. Can be fixed. 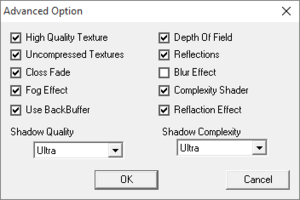 Most graphical settings, including AF and MSAA, do not work if Depth of Field and Back Buffer are enabled. However disabling back buffer does have side effect where main menu starts flickering, though is still usable. Highest supported resolution is 1920x1080. If your resolution isn't offered, selecting a resolution above yours (i.e. 1920x1080 on a 1600x900 monitor) will make the game render at your resolution. If you have a larger than 1080p monitor the game will upscale the image. Settings menu has values 1x, 2x, 3x and 4x. These represent 2x, 4x, 8x and 16x values. Nvidia users can follow this guide for better AA. If v-sync is disabled in the game options, it can't be forced by third party software. Gameplay is capped at 30 FPS. Play at resolutions higher than 1080p. Extract dgVoodooCpl.exe and dgVoodoo.conf to <path-to-game>, where game.exe and gurumin.exe reside. 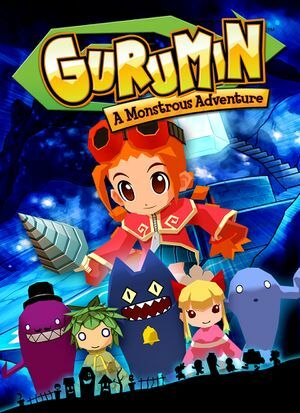 Open the MS folder in the dgVoodoo zip and extract DDraw.dll, D3DImm.dll, D3D8.dll, and D3D9.dll to <path-to-game>, again where game.exe and gurumin.exe reside. 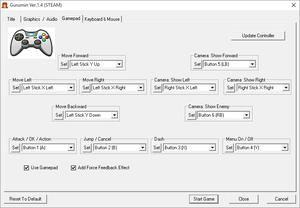 In the General tab, set Adapter(s) to use / enable to your current graphics card, Appearance to Full Screen, and Scaling mode to Stretched, keep Aspect Ratio. Button prompts assume you are using default control scheme. New game name entry requires at least mouse input. Deadzones are a bit lacking. See Controller deadzone fix. Partial. 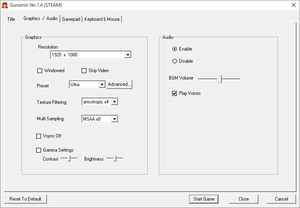 Ability to mute either all audio or just voices. Slider for music. This mod replaces English audio with Japanese. Backup map.itm in bin and all .itm files in 3dData before patching. 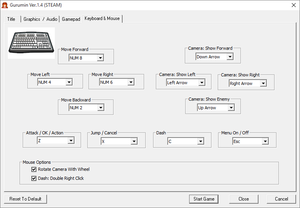 Uncheck "Use the Big Picture Overlay when using a Steam Input enabled controller from the desktop". ↑ 1.0 1.1 File/folder structure within this directory reflects the path(s) listed for Windows and/or Steam game data (use Wine regedit to access Windows registry paths). Games with Steam Cloud support may store data in ~/.steam/steam/userdata/<user-id>/322290/ in addition to or instead of this directory. The app ID (322290) may differ in some cases. Treat backslashes as forward slashes. See the glossary page for details. ↑ <path-to-game>\manual.pdf - "Additional Steam and Windows Development: Opus Studio Inc."
This page was last edited on 12 March 2019, at 00:46.